Recently I have shown the light level changes during the solar eclipse. The illumination level is strongly related with the sky brightness. Both of them changes in the same time throughout the eclipse. In this article I would like to focus on these changes, having an external data from Wolfgang Strickling. Because his observation venue was only about 200 km ahead I decided to use his measurements in terms of the Polish Society of Amateur Astronomers (PTMA) observation point. The sky brightness during totality can be measured by sky quality meter or sky brightness meter. Sky Quality Meter is used typically by amateur astronomers to quantify the sky glow aspect of light pollution. There are a several models of Sky Quality Meter offering different field of views and various automatic measurement and data logging capabilities. The Sky Quality Meter has become the most common device used to track the evolution of the brightness of the sky from polluted regions to first-class astronomical observatories (Sanchez et all, 2017). 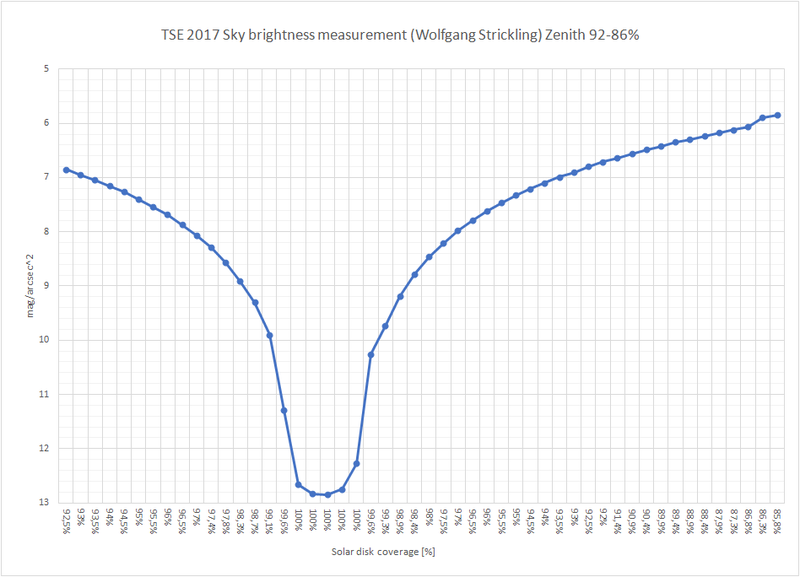 The sky brightness meter is a small device, that can be integrated with a weather station as follows Wolfgang’s Strickling solution. This small and handy design with autonomous by means of rechargeable battery is equipped with temperature, brightness and wind sensor. The newest and the most professional instruments has been presented during the Great American Eclipse, where the measurements has been done by tracking CCD camera with color filters and wide-angle lens allowed measurements across a wide field of view, recording images every 10s (Bruns, 2018). In the result also the sky color changes has been recorded. Other author used a tripod-mounted Fujifilm X-E2 camera with built intervalometer, which proceeded at one frame per minute (Dickson, 2017). In my work I will focus on Wolfgang’s Strickling instrument, because this is where my data comes from. The sky brightness measurements done by Wolfgang Strickling and opened up for me by his courtesy led me to take a detailed insight on this phenomena. Some of the general information are available on his website. Thankfully I got much detailed .csv data to further proceeds. 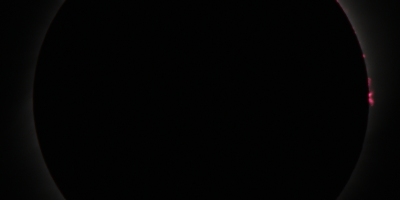 – The totality period difference on this distance (around 5 sec) has been omitted. – Weather conditions (mainly aerosols concentration) changes between these 2 places has been also omitted. – The solar position on the sky (53deg for us and around 51,5deg altitude with azimuth accordingly 141 And 139) has been also neglected. Despite the important omissions, that had to come through this results I came to very detailed Conclusions. 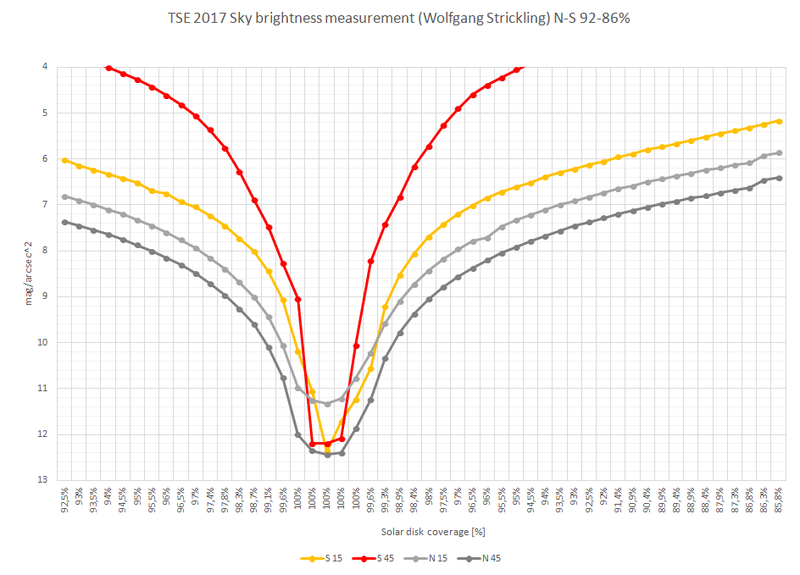 According to Wolfgang’s Strickling instrument the sky brightness measurements doesn’t cover a whole solar eclipse phenomena. The data range includes the period from around 15 min before totality to 10 min after, giving 27 min of full measurement. Because the data from extreme moments of the measurement were sampled on intermittent basis I decided to narrow these analysis down to 6 min before and after totality except for the overall charts giving a values up to 10 min after 3rd contact. 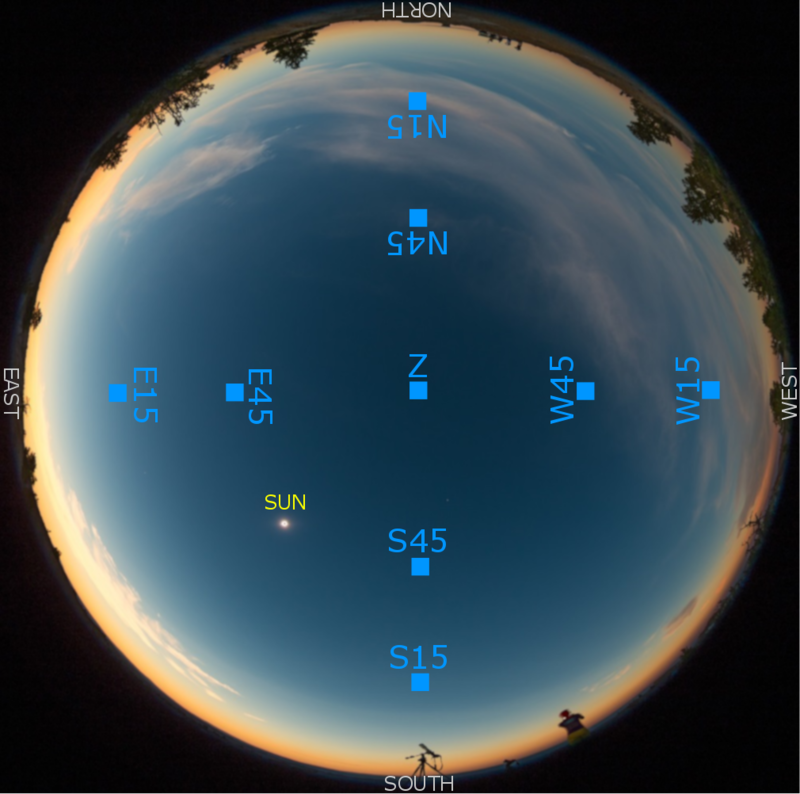 Wolfgang Strickling has been measured the sky brightness around the totality in 5 directions: 4 cardinal points and zenith. These measurements (except the zenith one) were aimed at 15 and 45 degrees above horizon (Pic. 1). Basically these angular distances from the horizon are the more haze-dependant, thus their brightness changes more effectively throughout the totality. Analyzing main plots we can infer the umbral impact on overall sky brightness in more or less all directions. Anyhow I am going to describe all these changes separately basing on my visual observations combined with my colleagues records and Wolfgang’s Strickling measurements from the Jackson Hole. The situation on northern and southern sky were quite straighforward. Because basically umbra was moving from west towards east the sky brightness changes towards these direction were the most simetric against mid-eclipse. However even here some differences has been recorded, because lunar shadow were moving roughly from WNW to ESE direction. The northern part of the sky remained the darkest throughout the whole eclipse phenomena due to solar position (Pic. 2). I have explained this issue before in this article and also in light level changes description. Because lunar shadow approached from north west the northern sky brightness drop was more noticeable before 2nd contact. The results clearly shows an quicker mag/arcsec increment in 1st partial phase for 45 deg altitude. The difference before-after mid-eclipse rises up to 0.02 mag for 93,5% obscuration and 0.03 mag for 94% obscuration. For this obscuration level there is still no difference for sky at 15 deg altitude, where difference was recorded for 94,5% obscuration. The biggest northern sky brightness difference has been noticed around 30 sec outside the totality for 99,6% obscuration (Pic. 3). According to the instrument the darkest northern sky has been recorded at 30 sec before 2nd contact and continued up to 30 sec after 2nd contact (Pic. 6). Before mid-eclipse the northern sky at 15 deg altitude started getting brighter reaching -0.04 mag/arcsec drop. General for altitude 15 deg above horizon the sky brightness changes remained almost symetrical with min value around 30-40 sec before mid-eclipse unlike to higher part of the sky (45 deg) with mid-eclipse minimum. At the mid-eclipse the northern sky brightness was 11.32 mag/arcsec for 15 deg and 12.44 mag/arcsec for 45 deg above horizon (Pic. 3,5,6). Pic. 2 North – South sky brightness comparison at the 3 major moments of totality. Southern sky appears to be slightly darker misleadingly, due to camera response. 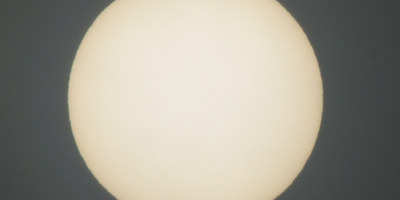 However this section contain much more yellowish tint present all way up from the horizon (footage: Tomasz Rać). Pic. 3 Sky brigtness measurement at northern section of sky within 92% obscuration, before-after comparison. Southern part of the sky behaviour differed much due to high haze presence and forward scattering occurrence (Pic. 4). A considerable difference is discernable between 15 deg and 45 deg altitude. The southern sky brightness difference is to be seen over the whole measurement period, although a noticeable difference is to be seen for 97% obscuration at 15 deg above horizon (0.16 mag) and 97,4% obscuration for 45 deg above horizon. We must know, that southern sky brightness variations were much bigger due to solar position around 53 deg above horizon. In terms of this the changes occurred proportionally to a whole result. At the beginning of the measurement the 45 deg sky brightness was 3.51 mag/arcsec2 (for 92,5% obscuration). At the mid-eclipse this value changed to 12.2 mag. The southern sky at 15 deg above horizon was a bit darker, due to bigger angular distance from the Sun. Initial sky brightness value was 6.02 mag and the lowest 12.37 mag (Pic. 5, 6). The biggest sky brightness difference has been recorded for 99,6% at 15 deg altitude and between 2nd and 3rd contact accordingly 1.49 mag for 45 degrees and 1.02 mag for 15 deg above horizon (Pic. 4). Another curious thing is the invert brightness change in before-after relation up to 97% (Pic. 4, 5). Pic. 4 Sky brigtness measurement at southern section of sky within 92% obscuration, before-after comparison. I am not sure about the reason here, because the measurements comes from the different place. I can guess, that this is because of solar position movement across the sky. The instrument was heading exactly southward whereas angular distance to the Sun was decreasing. The totality in Jackson Hole lasted earlier than in Riverton against the astronomical noon. As the angular distance was reducing the forward scattering became more significant, thereby sky brightness increased in the span of the time of measurement. Pic. 5 Sky surface brightness during the 2017 Greatest American Eclipse at north and south section of sky. Pic. 6 Sky surface brightness measured during 2017 totality at south and north directions. These sections of sky were the most interesting because they indicated almost correctly the shadow-in and shadow-out directions (Pic. 7). The sky brightness difference is the most asymetrical both on western and eastern section of sky. Bigger difference is to be seen for 15 deg altitude both on western and eastern part of the sky. Because the measurement covers the interval between 92% obscuration only there is no information about the moment, where this difference started to occur. For western part of the sky the umbra approaching has been recorded at 94,5% obscuration. The before-after difference value increased rapidly from 0.16 to 0.28 mag/arcsec2 (Pic. 8). Next significant changes occurs for 95,5% obscuration with similar values. The sky brightness before-after difference for 45 deg altitude is not as big as for 15 deg probably due to bigger thickness of the atmosphere, which was affected by lunar shadow on a longer way. At the upper sky the thiner atmosphere doesn’t incur big brightness changes, hence the before-after difference is less noticeable even in hazy conditions. Anyway here also the 94% is a significant moment, where before-after difference become bigger. The biggest values of this difference are to be seen accordingly at 2nd contact for 15 degrees (0.9 mag) and at 99.6% obscuration for 45 deg altitude (0.94 mag). The reason is that the lower part of the western sky start to brightening much faster than upper one after mid-eclipse (Pic. 8, 11). This significant difference persist until mid-eclipse, however decreases as normal pattern. At 30 sec before-after mid-eclipse the values are 0.51 mag for 15 degrees and 0.28 mag for 45 degrees. From the 4th second of totality to mid-eclipse the lower part of western sky is brightening twice quicker than upper part at 45 deg altitude (Pic. 8, 10). Pic. 8 Sky brigtness measurement at western section of sky within 92% obscuration, before-after comparison. Eastern part of the sky represent an opposite behaviour, but due to forward scattering the overall result is slightly different. First of all the sky brightness changes before-after difference occurred likewise on the western part. We can clearly see, that as mid-eclipse approach the lower part of the sky is darkening around twice faster than upper part. This situation happened from 2nd contact giving values accordingly 0.94 mag for 15 deg and 0.57 mag for 45 deg whilst 40 seconds later these values states 0.43 mag for 15 deg and 0.19 mag for 45 degrees altitude (Pic. 9, 11). Secondly the perfect view of dark shadow cone has been reported through these measurements. The biggest before-after difference has been recorded for 99,6% obscuration, which clearly reflects the dark shadow cone position. The difference value is 1.43mag/arcsec2 for 15 deg and 0.02mag/arcsec2 for 45 deg altitude giving accordingly 10.83 and 10.62 mag/arcsec2 (Pic. 9, 10). Becaouse of not big brightness difference the shadow-out sky featured quite uniform dark hue up to 40-50 sec after 3rd contact. Next, this hue was brighter and brighter. The before-after difference is getting lower as proceed further from the totality and shows, that lower part of the sky is brightening quicker up to 97,4% obscuration. This is the moment, when the grey shadow cone is definitely gone, leaving a bright sky with blueness washed out due to forward scattering. The last umbral presence can be spotted at 95% obscuration both for 15 deg and 45 deg altitude. By the end of the measurement the before-after brightness difference for upper part of the sky is vanishingly small with 0.06mag/arcsec2 magnitude only giving the value 6.53 mag/arcsec2 (Pic. 9, 10). Pic. 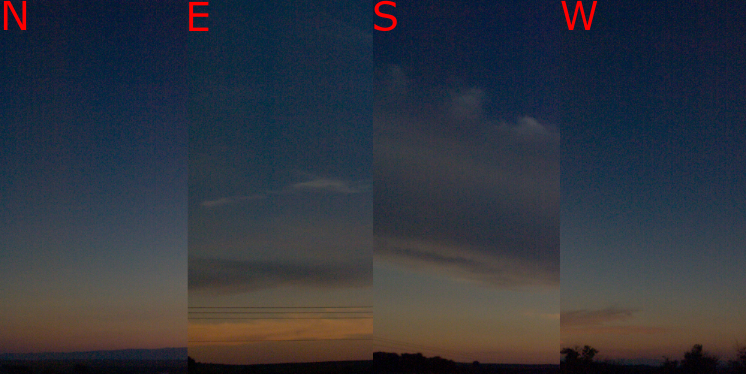 9 Sky brigtness measurement at eastern section of sky within 92% obscuration, before-after comparison. Pic. 10 Sky surface brightness during the 2017 Greatest American Eclipse at eastern and western section of sky. Pic. 11 Sky surface brightness measured during 2017 totality at eastern and western directions. Zenith sky reflected similar brightness changes to upper part of the western sky. Basically there is no difference for obscuration less than 98,7% (Pic. 12). A huge before-after brightness difference is to be noticed for 99,6% obscuration with 1.03 mag/arcsec2 value (Pic. 13). It was the moment, when 30s before 2nd contact lunar shadow started to cover the zenith sky. 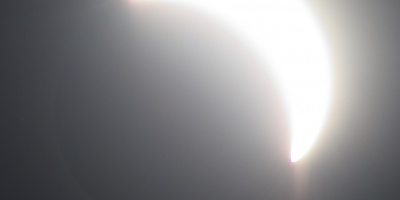 Unlike to 99,6% obscuration there is almost no difference for 30 sec against mid-eclipse. The zenith was one of the darkest part of the sky during totality and for sure the darkest measured direction with value 12.85mag/arcsec2. On the plot we can clearly see how the zenith sky starts to brightening immediately after the mid-eclipse (Pic. 14). Pic. 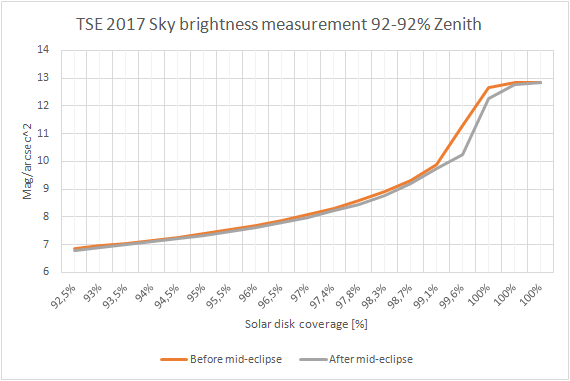 12 Sky brigtness measurement at zenith sky within 92% obscuration, before-after comparison. Pic. 13 Sky surface brightness during the 2017 Greatest American Eclipse at zenith sky. Pic. 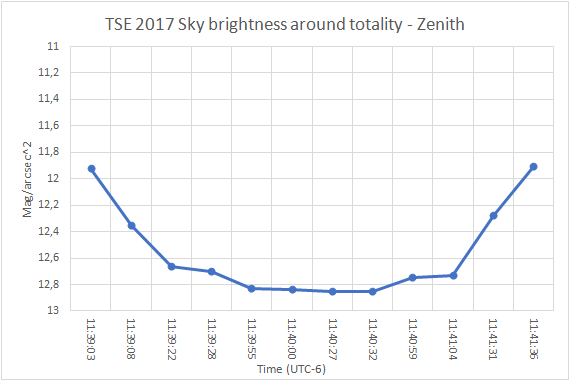 14 Sky surface brightness measured during 2017 totality at zenith. As a result of all measurements I have prepared an outlook onto all directions at once. My graphs contain a totality period only, because this period is the most important, showing the most significant difference of sky brightness between its particular regions. Pic. 15 The sky during the total phase of eclipse in all cardinal directions, captured just before the mid-eclipse. Olympus A510, 14mm, f/2.2m 1/25 with EV +1,5. Watching the picture above we can see a different sky brightness towards all cardinal directions. Southern and eastern sky was veiled by clouds, however we can still spot a slightly bigger brightness, especially near the horizon. Moreover eastern sky colour contains a yellowish tinbt, which is related to secondary scattered light, coming from illuminated area. Northern and western part of the sky looks is darker. 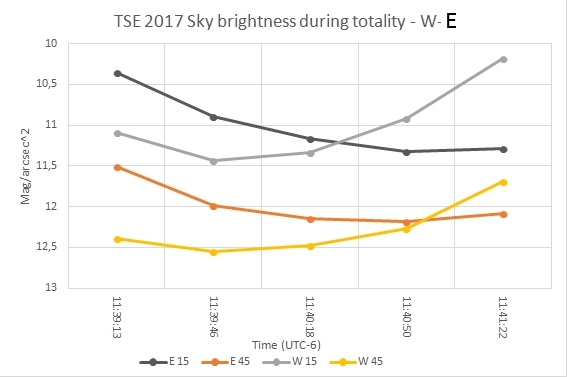 Is also worth to see the charts below, that shows a measured sky brightness at 3 key moments of the totality (Pic. 16 – 18) and see how the mag/arcsec2 values changed within this time. Pic. 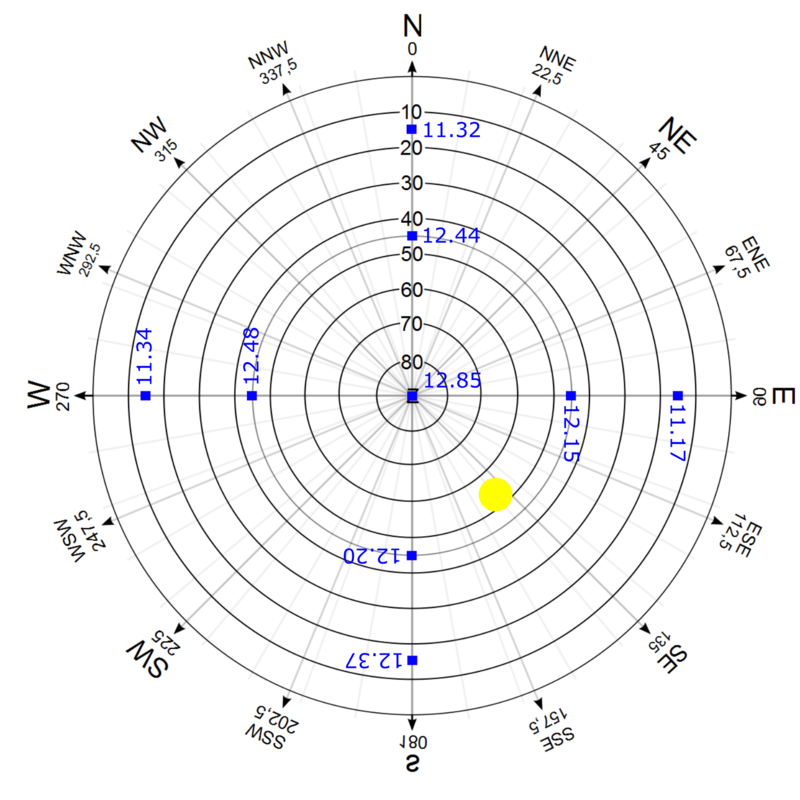 16 – 18 Sky surface brightness values (mag/arcsec2) for major moments of totality, where: 16 – – 2nd contact; 17 – mid-eclipse; 18 – 3nd contact. Comparing these 3 charts above we can see, that definitely the darkest part of the sky throughout the eclipse is zenith. This is understandable, because looking towards zenith we are looking through the thiniest part of the Earth’s atmosphere. The brightest section of the sky appears to be located near to the Sun, however an exception from this rule occur at mid-eclipse, when a southern sky was one of the darkest. One thing, that can explain this issue is a high-level clouds presence, which dropped down the values. I have no information about cloud coverage from Wolfgang’s Strickling measurement venue, although this results clearly shows, that some cloudiness at the southern part of the sky could take place, especially on lower altitude above horizon (which was darker, than upper one). Another reason is the Sun brightness itself, which during the totality drops down to -11,5 mag, lifting up the local sky brightness slightly, what can be visible on the graph (Pic. 17). A sky brightness on the northern part of the sky changed seamlessy and quite simmetrically against umbral contacts. Lower part of the sky remained much brighter, than upper one. Both western (shadow-in) and eastern (shadow-out) sections of the sky changed their brightness significantly and rapidly due to shadow movements. 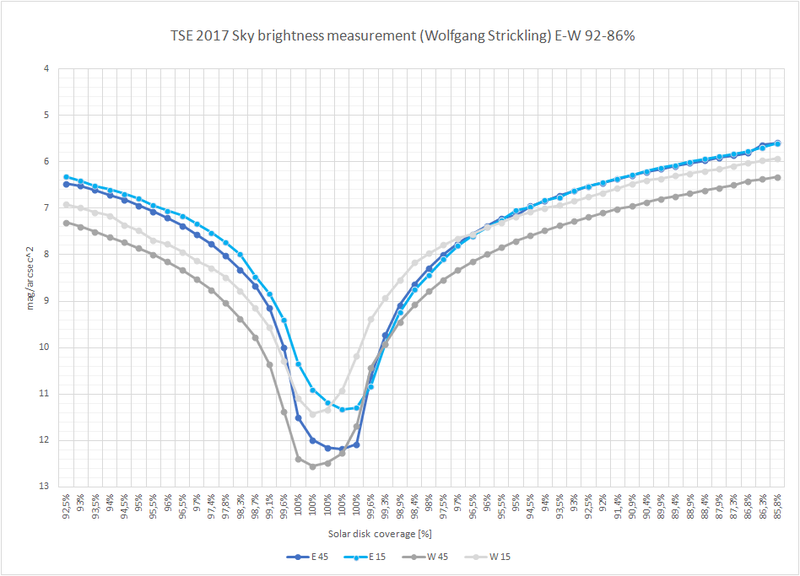 The sky brightness during total solar eclipse has been measured by Wolfgang Strickling and next moved on my observation position located 230km eastwards from initial place. Despite omission some factors the results were favourable. It found, that umbral movement across the sky is clearly visible and impact significantly on local sky brightness. At the very beginning of the measurement at 77,2% obscuration the sky surface brightness was from 1.86 mag at south 45 deg altitude (close to the Sun) to 6.16 mag/arcsec2 at west 15 deg altitude. The most detailed measurement includes the period before-after mid-eclipse down to 92% obscuration. For 92% obscuration the sky surface brightness varies between 3.42 mag/arcsec2 to 7.1 mag/arcsec2 at west 45 deg altitude. 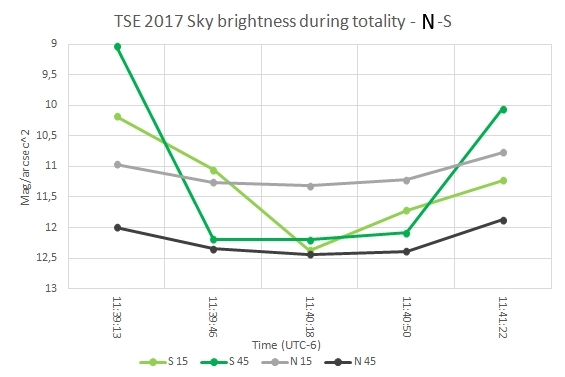 A charts shown in this article indicates important moments of sky surface brightness changes during near-totality period. Analyzing every section of the sky separately. For the shadow-in sky the most important moment occurred at 94% obscuration, when sky surface brightness started do fall down faster. Next the moment at 30 sec before mid-eclipse was the darkest for western part of the sky with values 11.43 mag/arcsec2 for 15 deg and 12.55 mag/arcsec2 for 45 deg altitude (2nd the darkest section of sky during totality). Opposite situation we could observe on the shadow-out sky with the darkest moment at 30 sec before 3rd contact, where the sky surface brightness reached 11.33 mag/arcsec2 for 15 deg and 12.18 mag/arcsec2 for 45 deg. The most remarkable moment for shadow-out sky was grey lunar shadow cone presence just after 3rd contact up to 40-50 seconds ahead. At obscuration 97,4% this shadow cone was gone. It can be seen on decreasing before-after sky brightness difference down to this moment. At 95% obscuration shadow presence at the sky dissapear. Sky surface brightness remains similar at both measured altitudes due to backward light scattering on haze. Northern and southern part of the sky was more symetrical, however even here we could spot the difference. Northern sky was a bit darker before 2nd contact. Southern sky was more affected by close solar position and possibly its movement across the sky throughout eclipse. Important sky surface changes on the northern side are to be seen at 98% obscuration. Southern part of the sky changes surface brightness rapidly from 97% obscuration on 15 deg and 97,4% obscuration on 45 deg altitude. The moment of umbra approaching on southern sky was clearly reflected on the measurements as well as shadow cone presence down to 99,6% obscuration after mid-eclipse. Also for zenith sky the most important moment was 30 second before totality when umbra covered it. At the mid-eclipse zenith sky was the darkest part of the sky with 12.85 mag/arcsec value. The brightest section of the sky at the mid-eclipse was north at 15 deg altitude with 11.32 mag/arcsec2. The result applies to typical total solar eclipse observation during mid-daytime hours when high aerosols concentration takes place. There is many other situations, where this kind of measurement could be carried out. I mean especially the horizontal kind of the totality, when umbra spreads throughout a whole sky dividing the atmosphere on 2 separate bright sections likewise when solar eclipse occurs below the horizon. The sky surface brightness changes can be also significant during the deep annular eclipses and deep partial eclipses, where Solar disk obscuration reach the values given. I hope, that my aim of observation will be inspiration for another eclipse chasers travelling around the world and someone will undertake a similar measurements in the future eclipses.